• Opt for newer models of vehicles that have electronic stability control. Teens are new drivers and as such, it’s easy to make mistakes, like taking corners too fast or too sharply. Stability control can go a long way towards ensuring that these mistakes don’t become actual accidents. • Air bags. Most cars have airbags, but not all of them have airbags that are ideal for a teen driver. You’re going to want a complete set of airbags. It’s not just new cars that have these – you will find that many good makes and models of second hand cars have good airbags too. Simply chat with the car dealership to get a selection of cars with these. • Crash test performance and size – airbags aren’t the only safety feature you should be worried about. 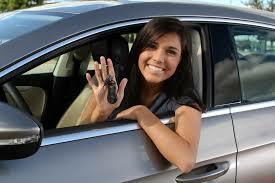 For your teen you need a car that is preferably compact in size and has good crash test performance ratings. All new cars have great safety features, but you will find that if you are on a budget, many second hand cars offer just as much in terms of crash test performance and stability control – especially in the luxury vehicles where these features become popular earlier. Don’t be fooled into thinking that all older cars offer limited safety. Always consider safety features before age of the vehicle – but of course, like everything, this should be done within reason. These are just a few of the things to look for when shopping around for a new or used car for your teenager. Of course you should also ensure that your teen is ready and willing to be a responsible driver. At our car dealership near Puyallup we are just as excited about selling you a new & used car as your teen is about getting one! We encourage you to visit our showroom and test-drive some of the cars that we have available. We can also help you with arranging vehicle finance if you don’t plan to buy the car outright. Contact us at Olympia Auto Mall for a wide selection of new and used cars for sale in the Puyallup and surrounding area.